The cause of the Oct. 6 crash was still being investigated by federal authorities. 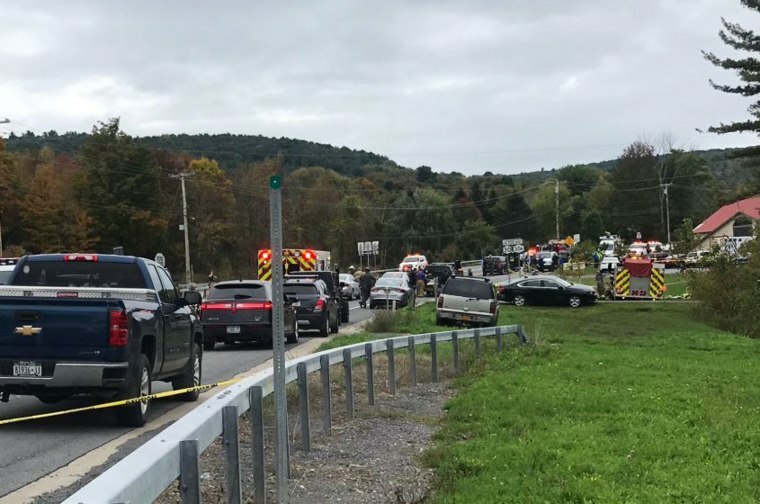 The cause of death for all 20 people killed in an Oct. 6 limousine crash in upstate New York was determined to be severe, traumatic blunt-force injuries, New York State Police Major Robert E. Patnaude said Friday. The autopsy results from Dr. Michael Sikirica of Albany Medical Center did not include conclusions from drug tests, which are pending, Patnaude said in a statement. Scott Lisinicchia, 53, was among those killed when the 2001 Ford Excursion he was driving barreled down a hill, passed a stop sign, and struck a vehicle in the parking lot of a country store in the town of Schoharie, N.Y. The passengers were headed to a brewery in Cooperstown to celebrate the 30th birthday of Amy Steenburg, who also was in the limousine. Two pedestrians also died when the vehicle struck by the limo hit them. The cause of the crash was being investigated by the National Transportation Safety Board. Federal safety records obtained by NBC News documented numerous citations for the vehicle in 2018, including having "brakes out of service" and being on the road without proof of proper inspection. "The owner of the company had no business putting a failed vehicle on the road," New York Gov. Andrew Cuomo said two days after the tragedy. Authorities said Lisinicchia wasn't licensed to drive a livery vehicle with so many passengers. His wife, Kim Lisinicchia, said he had complained to the limousine's owner, Prestige Limousine of Gansevort, New York, about the condition of the vehicle. The registered operator of the company, Nauman Hussain, was charged with criminally negligent homicide because he allegedly allowed an improperly licensed driver to operate a vehicle that was not authorized as roadworthy as a limo rental. "The sole responsibility for that motor vehicle being on the road on Saturday rests with Nauman Hussain," New York State Police Superintendent George Beach said earlier this month. His attorney, Lee Kindon, said prosecutors "jumped the gun" by charging Hussain. He said his client's father ran the company day-to-day.